Anagallis is a diminutive non-native plant with colorful scarlet flowers. The leaf shape and growth form are distinctive and make Anagallis relatively easy to identify. Old plants branch and spread almost as vines. It is found in camp, east turnaround, and west turnaround and is somewhat seasonal, being more abundant in winter. 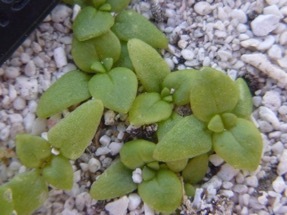 Anagallis cotyledons are cuneate, or wedge-shaped, with rounded tips. They share this shape with Oenothera but are sessile (lacking a stem) and smaller, which distinguishes them from Oenothera. The true leaves, when young, are sometimes almost perfectly heart-shaped, more generally ovate (oval) to elliptic (elliptical with rounded ends), and glabrous (lacking hairs). The leaves are sessile, that is they lack a stem, which gives them their distinctive, crowded appearance. Look for them southeast of the porch of the main building, in the clearing behind the bunkhouse, and in west turnaround. Description: Annual, biennial or short-lived perennial herbs; stems quadrangular, prostrate or decumbent, often rooting at the nodes, 1-6 (-9) dm long, forming compact mats. Leaves opposite or rarely whorled, ovate to elliptic or lanceolate, 8-20 (-25) mm long, 4-14 (-18) mm wide, glabrous, apex acute, base rounded, truncate, or subcordate, sessile and somewhat clasping the stem. Flowers on slender pedicels 5-40 mm long, recurved in fruit; sepals lanceolate, 3-5 mm long, margins scarious toward base; corolla salmon, sometimes blue or various paler colors, the lobes 4-5 (-10) mm long, minutely ciliate toward apex; staminal filaments hirsute with pale bluish hairs. Capsules papery, 4-6 mm in diameter, circumscissile, the style persistent. Seeds dark brown, ca. 0.8 mm long, minutely pitted (Wagner et al., 1999; p. 1077).